From one of the most exciting novelists writing in France today comes this literary saga of a dozen men and women - engineers, designers, machinery operators, cable riggers - all employees of the international consortium charged with building a bridge somewhere in a mythical and fantastic California. Told on a sweeping scale reminiscent of classic American adventure films, this Medicis Prize-winning novel chronicles the lives of these workers, who represent a microcosm of not just mythic California, but of humanity as a whole. Their collective effort to complete the megaproject recounts one of the oldest of human dramas, to domesticate - and to radically transform - our world through built form, with all the dramatic tension it brings: a threatened strike, an environmental dispute, sabotage, accidents, career moves, and love affairs ... Here generations and social classes cease to exist, and everyone and everything converges toward the bridge as metaphor, a cross-cultural impression of America today. Kerangal's writing has been widely praised for its scope, originality, and use of language. The style of her prose is rich and innovative, playing with different registers (from the most highly literary to the most colloquial slang), taking risks and inventing words, and playing with speed and tension through grammatical ellipsis and elision. She employs a huge vocabulary and, most strikingly, brings together words not often combined to evoke startling comparisons. Not since Vikram Seth's Golden Gate has such a great Californian novel been told. 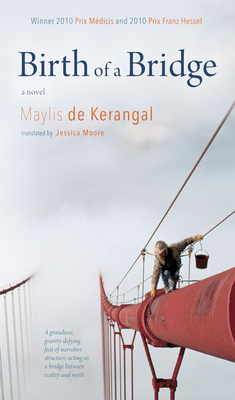 Maylis de Kerangal is the author of several novels in French. Her most recent, Naissance d'un pont / Birth of a Bridge, won le prix Medicis and le prix Franz Hessel. Jessica Moore is the author of Everything, Now, part lyric, part memoir, published in 2012 published by Brick Books. In the same year, Talonbooks published her translation of Jean-Francois Beauchemin's Turkana Boy. She also writes songs and plays the banjo - her band, Charms, launched a self-titled album in 2010 in Toronto.